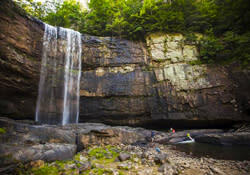 With more than 50 trailheads within 30 minutes of downtown, the hiking scene in Chattanooga is easily among the best in the Southeast, if not the entire country. From the slopes of Lookout Mountain to the steep crests of Signal Mountain and the Tennessee River Gorge, the Scenic City is blessed with a diverse and notable network of hiking trails. 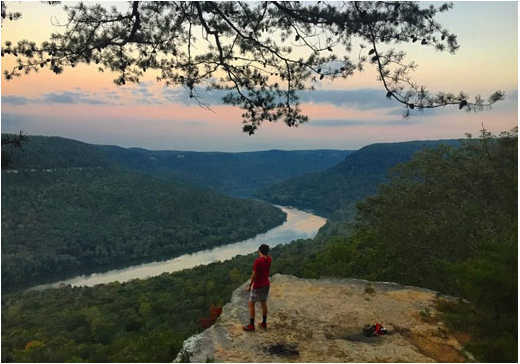 Considering the vast number of incredible hikes in the area, it’s admittedly quite difficult to narrow it down, but here are five of our favorite hikes in Chattanooga. The Big Daddy Loop is a route that lives up to its name; it’s a big one. 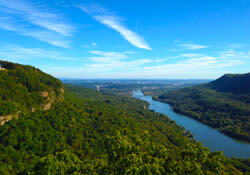 The 10-mile loop is composed of seven trails that trace the western face of Lookout Mountain and offer a combination of powerful uphill stretches and technical track that takes you nearly to the top of Lookout Mountain before stopping just shy of the summit to traverse the edge of the mountain on the beautiful Bluff Trail. The trailhead is located at the Craven&apos;s House halfway up the mountain. From Cravens, the trail connects with the historic Rifle Pits Trail, then drops down on the double track of the Guild Hardy before connecting with the Gum Springs Trail and later the Skyuka Trail. Then it’s a hefty climb up the John Smartt Trail until it reaches the peerless Bluff Trail where it’s back down to the Cravens House after three fantastic miles of gradual downhill hiking. From the parking area off of Montlake Road, taking the Lower or Upper Hogskin Trail (be sure not to follow the loop back to the start) will spit you out onto the North Chickamauga Section of the Cumberland Trail. And you better be ready! This 8.3-mile stretch yields creek crossings, wooden ladders leading down craggy slopes, and a few staircases to aid in navigating the testy terrain. But for many, the challenges offered on the North Chick trail are half the fun. The trail is also spotted with overlooks, the most notable being Panther Branch towards the end, cold pools for a quick dip during the warmer months, and amazing rock formations. If you’re still working up to the lengthy trek (out-and-back is a total of 16.6 miles) the Stevenson Branch Campsite at mile 4.1 acts as a great halfway point to turn back or as a chance to refuel. Starting from Signal Point—a perch that once served as a signaling post for the Union Army during the Civil War—this 2.9-mile (one way) stretch of the Cumberland Trail is a technical track that travels down a steep, forested gulch and then shoots back up the opposite side of the gorge before traversing the edge of a grassy ridge and eventually reaching one of the best viewpoints in Chattanooga: Edward&apos;s Point. The trail starts with a set of steep, wooden stairs known as the “Mouse Trap” and in less than a mile, it reaches the Julia Falls Overlook, which yields a fantastic view of the Middle Creek Gorge. Then it’s past Rainbow Falls (you’ll hear it gushing to your left, but stay on the trail), down to Middle Creek and Rainbow Lake, across a rustic swinging bridge, and back up the other side. Once you reach Edward&apos;s Point, the views of the Tennessee River and Williams Island and distant downtown Chattanooga make it all worth the effort. 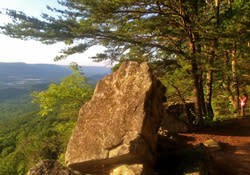 Lula Lake is easily one of the Chattanooga area’s most stunning natural destinations. Within the lake’s punchbowl formation are waters so brilliantly turquoise that, were it not for the amphitheater of sandstone ringing the bowl, one might think he or she’d been transplanted to a faraway island in the Caribbean. Then, just when it seems like the surroundings couldn’t be any more beautiful, the silky ribbon of whitewater descending from Lula Lake cascades a few hundred feet further downstream until it dramatically spills over the side of a precipitous cliff, creating the majestic Lula Falls. Located on the eastern slopes of Lookout Mountain, Lula Lake and Lula Falls combine to form the very obvious centerpiece of the Lula Lake Land Trust, an 8,000-acre tract of private property that offers incredible hiking opportunities. 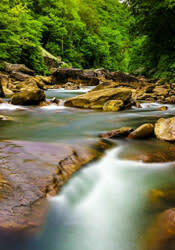 A variety of trails and old railroad beds lead to scenic overlooks, alongside the dawdling waters of Rock Creek, and down to the base of the falls. While the individual trails typically range from .25 miles to 1.25 miles, the combined trail system makes for a great 6-mile jaunt. Given that the Land Trust only opens its gates to visitors during the first and last weekend of each month, you’ll want to make the most of it while you’re there. *Note: Starting February 23, 2019, access to Open Gate Days at Lula Lake Land Trust will only be available via online registration on a first-come, first-served basis. Reservations can be made in advance here. Cumberland Trail falls between the North Soddy Creek Gorge (to the south) and the Rock Creek Gorge Section (to the north). The Possum Creek stretch runs for 9.5 miles one way, so if you plan to do this in a day, get started early, and consider planning a shuttle with one car parked at each trailhead. If, on the other hand, an overnighter is what you’re after, there are established campsites at mile 3.2 and mile 7.1 that make for a memorable camping experience. 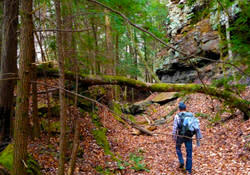 The trail features the characteristic climbs and descents of the Cumberland Trail (with roughly 1,000 feet of elevation change in the first four miles, if starting from the Heiss Mountain Trailhead), and it comes complete with cascading streams, rhododendron tunnels, ferns, wildflowers, towering rock bluffs and sandstone outcroppings, and of course the spectacular Imodium Falls—a fantastic place to take a dip during the warmer months.